The OM-CP-HITEMP140X2-TD series of dual probe data loggers offer extreme flexibility for high temperature monitoring applications. These models all feature a 5.1 cm (2") rigid transitional diameter probe to measure ambient temperature, combined with a second bendable or flexible probe option. The rigid ambient probe is made of stainless steel, offers a fast response time and is suitable for the harshest environments. 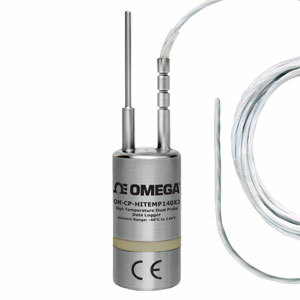 The OM-CP-HITEMP140X2-TD-PT-1 and the OM-CP-HITEMP140X2-TD-PT-5 models combine the 5.1 cm (2") rigid ambient probe with a 61 cm (24") bendable probe made of stainless steel with either a 2.5 cm (1") or 12.7 cm (5") probe sheath at the tip. The stainless steel PT probe options provide the ability to retain shape when bent into position and offer an extremely high measurement range of up to 350°C. The OM-CP-HITEMP140X2-TD-FP-72 combines the 5.1 cm (2") rigid ambient probe with a 183 cm (72") long lightweight RTD flexible probe, designed for easy placement. The flexible probe option is very pliable and coated with PFA insulation making it ideal for use inside small vials and test tubes. This probe style has a narrow diameter, high accuracy and is ideal for steam sterilization and lyophilization. The flexible probe is also compatible with the OM-CP-MICRODISC probe attachment, used for the surface temperature monitoring of shelving and more. The operating temperature range for the data logger body is -40 to 140°C (-40 to 284°F). Because of the simultaneous ambient and remote temperature recording, the OM-CP-HITEMP140X2-TD series is ideal for use in autoclave mapping, food processing applications, and much more. The OM-CP-HITEMP140X2-TD series utilizes the latest software. This allows for simple starting, stopping and downloading of collected data. The devices are able to store up to 32,700 time and date stamped readings in non-volatile solid state memory. Once the readings have been downloaded to the software, it can be viewed in graphic, tabular, and summary form for easy analysis, as well as the potential to be exported into Excel for further calculations. The OM-CP-MULTIMOUNT-Z is a versatile mount or stand for use with the OM-CP-HITEMP140 series of data loggers. It can be used to stabilize a logger inside an autoclave, or screwed to a flat surface to create an anchored base. Made of 316 stainless steel, the OM-CP-MULTIMOUNT-Z is able to withstand temperatures up to 150°C (302°F) making it ideal for use in autoclave sterilization processes. Nota: Comes complete with 3.6V lithium battery. Operator’s manual and USB interface cable are included with the OM-CP-IFC400 software/cable package or OM-CP-IFC406 multiplexer (required for data logger operation, sold separately).